01.) We sure do love Annelise's teachers but I must admit that we might love a teacher's workday even more. 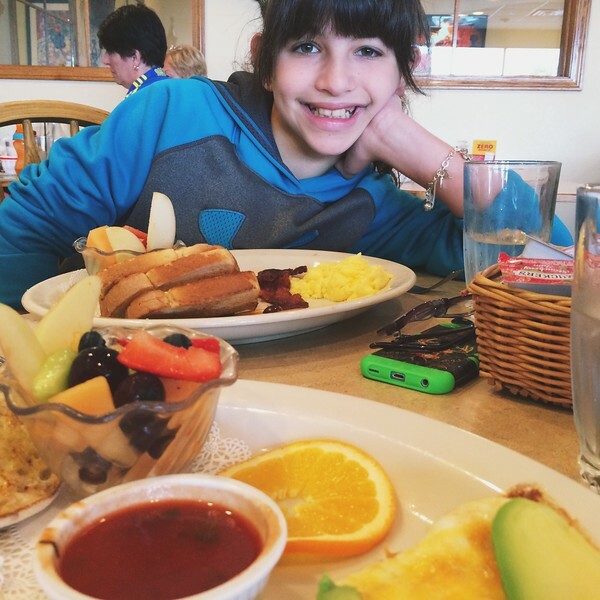 Sleeping in + breakfast out at our favorite joint = the best! We got there even later than planned thanks to a quick stop in James Avery followed by a pop-in to World Market. You know how these things can happen. 02.) 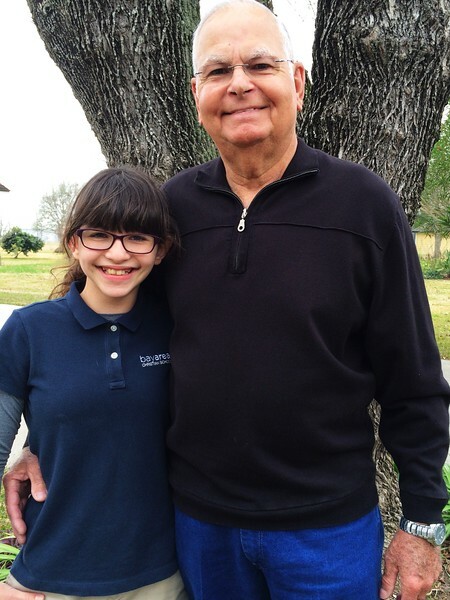 My sweet daddy celebrated his 74th birthday yesterday! It suits him nicely I think. We stopped by for a quick visit after school yesterday with cards and candy, because, candy. They were on their way out to an early bird supper with his brothers and niece (and their respective spouses). They have birthdays near each other's so they try to always get together somewhere in between, this year it fell on Daddy's actual day, so that's neat. Eating at 4:30 is practically lunch but I guess when you are of a certain age this is the norm. 03.) I think I may have alluded to my obsession with all things Jen Hatmaker in my last post (but not in a creepy stalker way, pinky promise). She had posted recently about a yummy salad made by one of the Roberstson's clan (Aunt Carol) and it reminded me of one of my favorite salads, Asian Cabbage Slaw, which can and should be eaten by the truckload. But I never did anything about it, as per usual. Until she posted again about her addiction to Aunt Carol's salad. That was my trigger. I made a screen shot and headed to Kroger after taking Annelise to school the next morning because my life could go no further until I had the ingredients to make this salad. Then I made an executive decision right there in the produce. 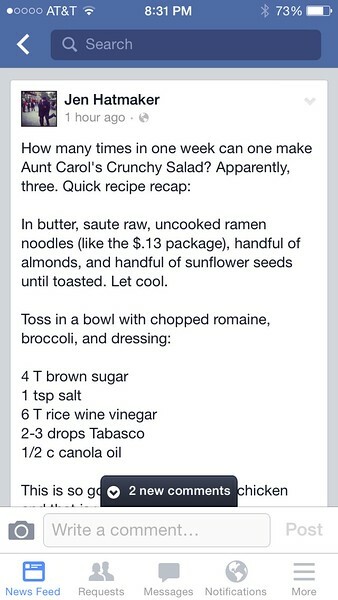 Why not combine elements of Aunt Carol's salad AND my Asian Cabbage Slaw? That, my friends, would be salad perfection. Chopped kale (y'all, this comes in a bag and makes life so much easier), coleslaw (yep, in a bag, I'm lazy), broccoli (not in a bag, actually chopped it myself), broccoli slaw (in a package) and romaine (you guessed it, bag). I sautéed broken ramen, sunflower seeds and chopped almonds in butter until toasty and delicious like the above recipe says. For the dressing I made an Asian dressing (the directions are on my Pampered Chef dressing container, so I don't know exact measurements, but it has rice vinegar, soy sauce, ground ginger, pressed garlic, sugar and canola oil) that's similar to the ones for Aunt Carol's and ACS. Instead of mixing everything together I lust layered up my salad each day and added dressing, that way nothing gets wilty and sad. Truth: this has been my lunch for the past four days. And I am not ashamed. 04.) I triple dog dare you to not get Uptown Funk stuck in your head. And smoother than a fresh jar of Skippy. 05.) Have y'all been following Humans of New York? If not, why not? It's been a delight to see Vidal and Ms. Lopez's story unfold. Like all the way to the White House. Love Jen Hatmaker!!!!! I make an asian salad similar to yours except I add 2-3 T of sesame oil, green onion and mandarin oranges with some chicken thrown in sometimes. You can also add cilatro if you like it.